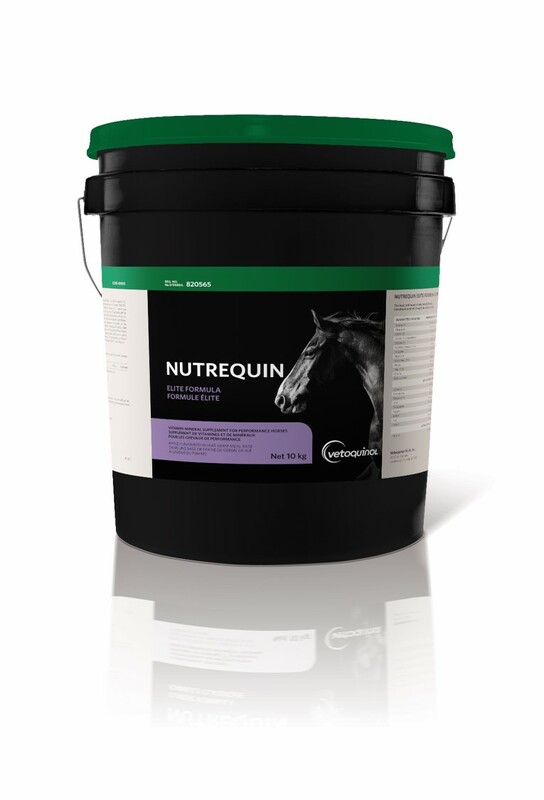 Nutrequin® Elite in addition to the daily feed mix can supplement your horse's nutritional needs. Ask your veterinarian about Nutrequin® Elite. Nutrequin® Elite contains selenium-enriched yeast (Reg. #982026), vitamin A, vitamin D3 (Reg. #990017), d-alpha tocopheryl acetate (Reg. #990720), menadione sodium bisulfite complex, vitamin B12, thiamine mononitrate, riboflavin, pyridoxine hydrochloride, calcium d-pantothenate, niacin, folic acid, choline chloride, beta-carotene (Reg. #990019), D-biotin, wheat-germ meal, dehydrated alfalfa meal, monocalcium phosphate, salt, magnesium oxide, zinc proteinate (Reg. #990257), manganese proteinate (Reg. #990256), copper sulphate, calcium iodate, iron proteinate (Reg. #990255), potassium chloride, ground limestone, cobalt sulfate, iron sulfate, manganese sulfate, zinc sulfate, L-threonine, DL-methionine, flavouring agent (Reg. #880154), sweet molasses (Reg. #980351), mineral oil.